Many teachers need help covering out-of-pocket classroom expenses. * Schools also need financial assistance for updates to provide a technology-rich education to students who need to gain skills necessary to excel in the global economy. VocabularySpellingCity Premium Membership is an approved product in various crowdfunding sites that help teachers and schools connect with supporters to get donations for funding classroom needs. AdoptAClassroom.org is a non-profit organization to connect donors with K-12 teachers in U.S. public, private and charter school classrooms. Donations are tax-deductible and 100% of donations are passed along to the teacher. VocabularySpellingCity Premium Membership is an approved project for Adopt-A-Classroom funding! Register by visiting Adopt-A-Classroom.org. List the expenses that you need help covering, such as a VocabularySpellingCity Premium Membership. By registering, your classroom will be posted on the Adopt-A-Classroom website and made available for donors to select. Be proactive! Use the tools provided by Adopt-A-Classroom to e-mail your students’ parents; friends and family letting them know you are registered with Adopt-A-Classroom! You can provide them with a link to your Adopt-A-Classroom page and they can make a tax-deductible donation to your classroom online. Parents, PTO or PTA may want to pool funds. Use this sample letter to request donations. Spend your donated funds! You will have full discretion to purchase supplies for your classroom from Adopt-A-Classroom’s network of online vendors. You can purchase resources such as VocabularySpellingCity Premium Membership. Show your appreciation. Adopt-a-Classroom tools help you report the impact of donations to your donors. Adopt-A-Classroom orders are processed by VocabularySpellingCity within 24 hours of receipt. The order is applied and the teacher is notified by email that their Premium Membership has been activated and paid for by Adopt-A-Classroom. Register your classroom or review more information on Adopt-A-Classroom.org today. Visit Adopt-A-Classroom.org. Search for your teacher, school and location. Donate, and help a classroom! DonorsChoose.org is an online charity that connects donors with American public school teachers to fund classroom needs. There is a $1 minimum donation. 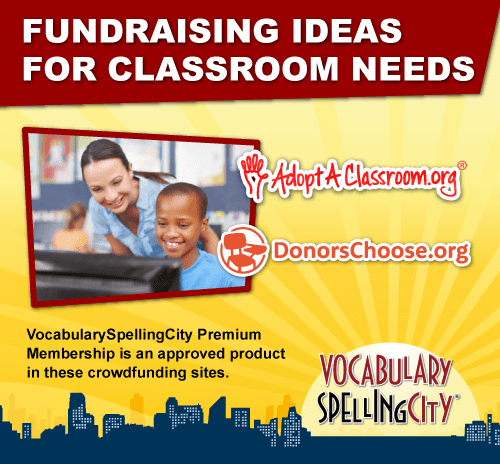 VocabularySpellingCity’s Premium Membership is an approved product for DonorsChoose.org funding. Register with DonorsChoose.org to create your classroom project wish list. Tell parents and the community about your project on DonorsChoose by sending home a note, email or social media post which includes the link to your project. Take care of the order details with VocabularySpellingCity before or after your project reaches its funding goal. Before funding: To request a quote for DonorsChoose, please contact sales@spellingcity.com. After funding: Once your project has reached its funding goal, you’ll receive a verification email from DonorsChoose, with a project ID number. Search for your teacher’s project on DonorsChoose.org. After the project is funded, you’ll get a thank you note from the teacher and a cost report showing how each dollar was spent. *Some states prohibit gifts to public employees (including public school teachers). Check with your school’s principal regarding their policy on gifts.